Navigating the sea of department store fragrances is getting easier—and less stinky—because of the internet and mobile devices. IPerfumer, which may be the first fragrance app on the mobile market, works like everything else on the internet: recommendations based on personal and group ratings. The bad news is that there’s a whole world of colognes beyond department stores but unfortunately, this free new iPerfumer app is oblivious to it. With any luck, apps like this will make it less painful for guys to explore colognes outside of their medicine cabinets—and reduce the need to brave the cosmetics floor. 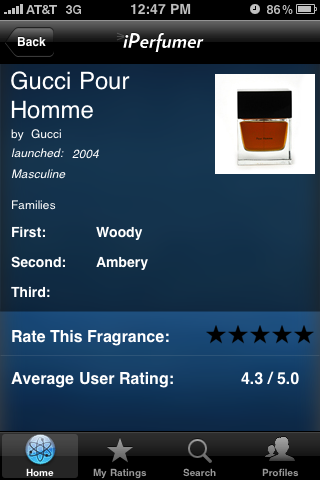 After you enter some basic facts (gender, age, country), the app allows you to rate on a five-star scale the basic families of fragrances: Citrus, Chypre, Floral, Fougere, Oriental, and Woody. Once you’ve done that, you can rate your own favorites—if you can find them. Despite a database of 4,000 fragrances for both men and women, I didn’t find all of my favorites. IPerfumer found selected Frederic Malle fragrances, but had nothing in its database from Amouage, Annick Goutal, Bond No. 9, CB I Hate Perfume, Creed, Eau d’Italie, Le Labo, Miller Harris, or Parfums de Nicolaï. That’s okay. Givaudan, the centuries-old Swiss fragrance company that created the app, admits this is a work in progress. Givaudan has created some of the market’s more popular contemporary fragrances, like Angel by Thierry Mugler and Armani Code, along with some modern classics like Opium and Obsession. Fortunately the app isn’t limited to Givaudan’s own roster. Based on my settings and ratings, the app recommended two pretty mainstream luxury scents, Gucci Pour Homme and Opium Pour Homme, along with two I’d never heard of: Esencia by the Spanish leather and luggage firm Loewe and Jules by Christian Dior. Gucci, a woody scent, was an odd recommendation. I generally dislike woods, and I rated them low when I signed onto the app. I got a sample of Gucci a couple years ago from a toady salesman at Bloomingdale’s who delighted in pronouncing it Gucky. I thought it smelled like a jerk with a fake tan and an attitude. Should I give it another chance? The app also recommends a number of female fragrances. Among mine were Marc Jacobs Daisy, Gucci Eau de Parfum, Etro Ambra and Curious by Britney Spears. Hmmm. I don’t know how to react to that. Are these scents that I might like to sneak a try on my own skin? Do they think I’d like them on a woman? It’s more likely that the recommendation engine can just as easily pick feminine scents based on the same set of ratings that I gave for masculine scents. 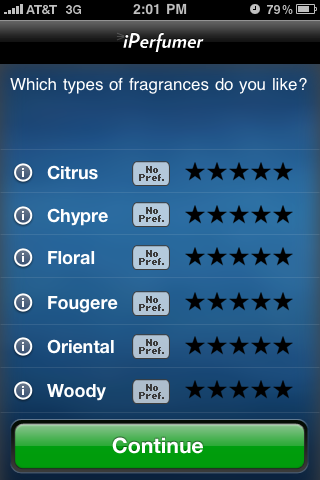 There’s a predictable list of “Top Rated” fragrances, presumably chosen by all of the apps users. On top is Armani’s unstoppable Acqua di Gio, an inoffensive citrus and woody blend that happens to be the best-selling fragrance for anyone, men and women (according to NPD Group, which tracks fragrance sales in major retailers). Samples. If this app had links to get free (or even cheap) samples, that would be revolutionary. It should also allow users to search by scent categories (citrus, woods, etc. ), not just name. Another opportunity for improvement would be user reviews, like the web community Basenotes.net provides. 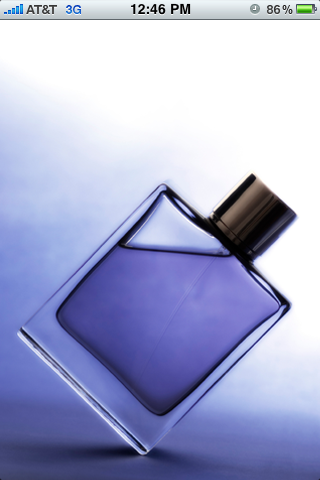 Star ratings and simple descriptors tell even fragrance enthusiasts painfully little about how a cologne really smells. In fact, I’m surprised that Basenotes didn’t come up with this idea themselves. If they simply harvested their site’s huge trove of data and its user community, they could create a far superior app to iPerfumer. And their community may even be willing to pay a modest fee for it. Perhaps better still, why not make Perfumes: The A to Z Guide by Luca Turin and Tania Sanchez into an app? Charge $10 for it and market it as an alternative to the paperback. All criticism aside, iPerfumer is superb start. Imagine: a 4,000-scent recommendation engine that you can bring to the department store. That’s pretty amazing, and I can’t wait to see how it evolves. This entry was posted in Cologne, Technology and tagged acqua di gio, amouage, angel, annick goutal, armani code, basenotes, bond no 9, britney spears, cb i hate perume, christian dior, creed, eau d'italie, esencia, etro, frederic malle, givaudan, gucci pour homme, iperfumer, jules, le labo, luca turin, marc jacobs, miller harris, obsession, opium, parfums de nicolai, perfumes the guide, tania sanchez, thierry mugler. Bookmark the permalink.